Beneficial bacteria keeps your pond clean and your fish healthy! 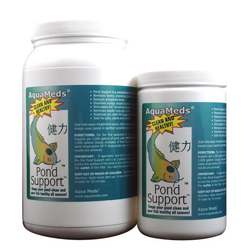 Pond Support is a concentrate dry beneficial bacteria that removes bottom sludge and deadly hydrogen sulfide and its bad odor. Plus, Pond Support's unique slow release oxygen formula improves life supporting oxygen throughout your pond. Helps keep your pond clear and reduce phosphate levels and unwanted nutrients. Some ponds may need treatments once per week until desired results are achieved. If applicable, turn off U.V. for the first 48 hours after application. Mix Pond Support with 1-2 gallons of pond water, stir vigorously and scatter across the surface of the pond or pour into the waterfall or skimmer basket or near the outlet of the filter. You want the product to circulate through the pond water.